Clemson, SC – The men’s cross country team is ready for the 54th annual ACC Championships this weekend, which will be held for the second straight year in Charlottesville, VA. The 8K race will start at 10:00 AM Saturday at the Panorama Farms course. 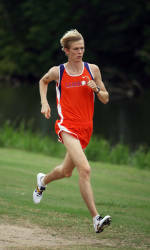 Clemson finished fifth in the team race a year ago, but boasted the league’s individual champion in Itay Magidi. His eligibility has expired, but another Tiger senior should be among the favorites this Saturday as well in the form of Hyannis, MA native Matt Clark. He was runner-up in the conference in 2005 and is coming off a 14th-place finish at Pre-Nationals two weeks ago. Clark’s return was crucial for the Tigers. He missed the Notre Dame Invitational earlier this season due to injury, but came back strong with a personal best 8000m time of 23:37 in Terre Haute, IN. Bryce Iverson hopes to repeat his All-ACC performance from the 2006 season. The junior from Manassas, VA improved his time dramatically in the span of two weeks from the Notre Dame Invitational to the Pre-NCAA Championships. He finished eighth in the conference race last year. Sam Bryfczynski has been steady this season and is posting the top times of his career. He has been under 25 minutes in both meets so far this season, culminating with a personal best time of 24:40 at Pre-Nationals on October 13. He finished 41st at ACCs last season. Matt Bruce, a freshman from Ontario, Canada, has performed well. He had a time of 24:49 at Pre-Nationals two weeks ago, which is the top time in school history for a freshman at the Terre Haute 8000m course. Bruce also scored at the Notre Dame Invitational for the Tigers. Brian Soder and Will Noble, a pair of veterans, both improved their times from Notre Dame to Pre-Nationals. Noble had a career-best 25:29 mark at Notre Dame and finished 91st in a strong field. Also making the trip this weekend for the Tigers are freshmen Chad Holt and Jonathan Sunde. A native of Greenville, SC, Holt improved his time by 33 seconds from Notre Dame to Terre Haute. Sunde finished 15th at the Furman Invitational two weeks ago, best among a trio of Tigers who made that short trip.